KI Store LED Halloween Candelabra for Halloween party, home décor and office decoration. Classic design and well made. This Lighted Halloween decorations features glittered base decorative spiders and bushes, 3 flickering LED candle lites. Classic elegant Halloween decorations. Use as your centerpiece or add to your mental and windows for the upcoming Halloween. Flameless Halloween lights battery operated by 3 AA batteries (NOT Included). Powered by batteries, no smoke or scent, won't cause any dangerous fire case. 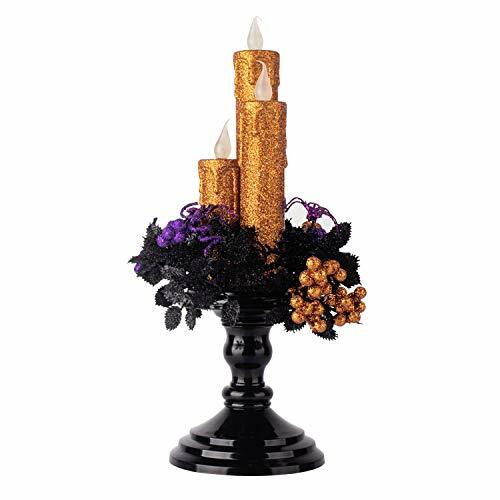 Halloween candle holder size: 15 Inch in height and 6 Inch in width. Nice gift packaging, perfect as gift. Pack of 1. If you have any questions about this product by KI Store, contact us by completing and submitting the form below. If you are looking for a specif part number, please include it with your message.